Jessica Worthey, a student at Tarrant County College, was awarded an Honorable Mention commendation for her essay in the Whitaker Foundation Art History Fall 2018 Scholarship Program. Her hometown is Fort Worth, Texas. The essay writer was asked to describe the differences in the way watercolor artists Frederic Whitaker and Eileen Monaghan Whitaker approached architecture. 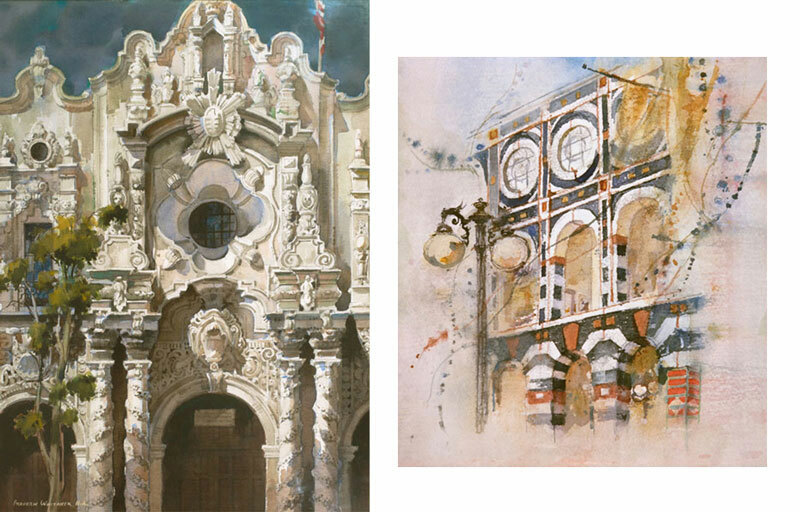 The two watercolors used as examples in the essay question were Frederic’ Whitaker’s Baroque Façade, 1968 and Eileen Monaghan Whitaker’s Horton Plaza, 1980s. Frederic and Eileen Whitaker are both accomplished representational watercolorists, especially with their works with architecture. Though both worked with architectural subjects, each artist possesses a vastly different style of rendering and defining these constructs from one another. To begin, Frederic Whitaker’s Baroque Façade possesses a more classical approach when it comes to depicting architecture in Fine Art. The artist excels at interpreting the finest details that supply the work superb dimension, truly defining the most intricate and defining features that give life to something most people find rigid and stale. The richness of the colors used, especially so with the deep dusty blue sky that lifts the foreground into focus, grab the viewer’s attention and pull them in into discovering all of the ornate details the building has to offer. The brightness of the tree in the very front also aids in this focusing of the building as well, as it helps to alleviate the overwhelming presence the building could have as it takes up the majority of the piece, and also works to center and solidify the position of the façade itself as one in between the two rich colors. One detail in particular that caught my eye, as it most likely did to others as well, was the subtle hint of blue in the concave cavity of the rose window and the dark blue the window holds itself. This pop of color led me to other features around the window: the deep green shadows surrounding the sun-like disk feature, leading my eye up and around to the hints of bright green defining where the sculptures defined themselves from the cornice-like structure of the façade, and eventually to the top where the flat of the building was colored with earthy red hues, which caught my attention by being complimentary to the greens I had just seen. All of these pops of color are appealing to viewers, as buildings do not inherently bear these hues and can be seen, as I mentioned before, as stale. These subtleties in the change of color in which Frederic Whitaker defined the building’s façade of complex Baroque architecture is still realistic and gives the work as a whole a stated presence to the viewer, all while being stylistic to Whitaker’s tastes and appeal. The Baroque style is known for its dramatic presence in the art world, especially present in the variety and stark contrasts with lights and shadows. This intensity is not lost with Whitaker’s rendition and it is clear the artist wanted to keep true to the original craftsmanship of the building, and he did so by vividly enhancing the many defining features, especially so in the main focus of Baroque Façade, including the tympanum, the rose window, and ornate sculptures that lie above the main portal into the building. Whitaker aimed to enhance the beauty that was already present, rather than morphing the subject into an artificial spectacle. While Frederic Whitaker’s depiction of architecture is based on staying true to the composition of said architecture while making the subject more appealing to viewers, Eileen Whitaker’s approach to the same subject is much more stylized and even abstract. In her piece Horton Plaza, Eileen disassociates the façade of the building with all other architectural and infrastructural features that may surround it. The building is only encompassed by fading and blended patches of color: a light blue wash above the top, possibly implying the presence of the sky, and light earthy red washes along the right, left, and below the building, most likely suggesting the presence of other buildings and terrain. Even so, there is little sense of solid space, as the wall depicted has no defined edges on the bottom or on either side, essentially freeing the wall of feeling stagnant or solid, characteristics that are typically associated with architecture. Earthy brown colors are used for the interior past the arches which exude feelings of warmth and security, which contrasts the vibrant and dark exterior that can be interpreted colder which pushes the structure out and suggests a feeling of space. Even with the prominent placement of the street lamp in the foreground, the lamp trails off to fade away at the same place the building does, so while the lamp gives the viewer a sense of where the building is placed in space, it is not concrete. Due to the way the artist created the wall, which can be described as free-willed and fluid, the subject becomes organic in a way that allows more human interpretations, such as feelings and emotions, to the work. In this way, Horton Plaza is personable and lively in a way the actual structure cannot be. The use of colors is tactical, as Whitaker only uses very few varieties, including black, yellow, brown, red, and blue. With the limited use of colors, the expectation for the outcome of the piece would be one that is, again, stale. The ways she manipulated the watercolors is what gives her artwork life; the ill-structured and fading strokes of watercolor coupled with the sporadic lines of splashed paint across and around the subject give so much character to the already nontraditionally painted building. Through her methods, it is assumed that the feelings produced by the architecture, such as excitement and warmth, were experienced at the actual site and reproduced into the work presented. Horton Plaza is almost ethereal in this way, almost as if it is otherworldly because of the fluidity and personified character she granted to the work. The way Eileen Whitaker depicts her architectural subjects is exciting, carefree, and abstract in that she does not let the typical structural norms that come along with architecture define or take over her work.